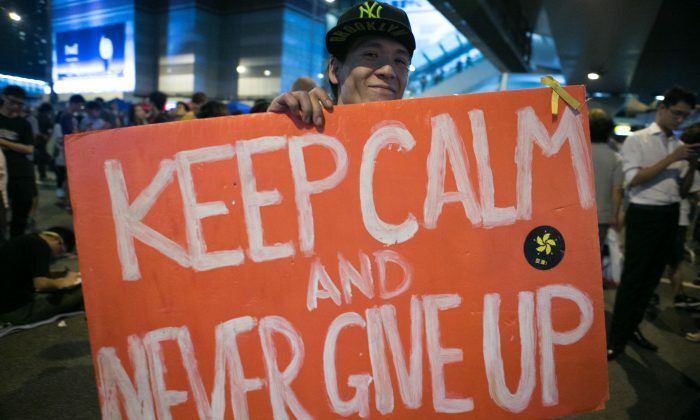 HONG KONG—The teenagers and young adults that have become the de facto leaders of Hong Kong’s decentralized protests concluded a second “preliminary discussion” with government representatives on Monday, a prelude to actual discussions hoped to begin later this week. The students vowed not to back down on their occupation of key areas in Hong Kong, and many thousands were still sprawled across the roads around Admiralty, where the chief executive’s headquarters, the Legislative Council, and government offices are located. Though the turnout was dwarfed by Saturday’s mass rally of tens of thousands, there was still a lively presence in the afternoon and well into the night. In the afternoon Lester Shum, the deputy secretary of the Hong Kong Federation of Students, in his black t-shirt and head of disheveled hair, said that the student representatives had agreed on three items (“multiple meetings, mutual respect, and promise to implement points of consensus”) with their government counterparts, and that they welcomed the progress, hoping for formal discussions to begin on Friday or earlier. The charismatic 17-year-old Joshua Wong, who established Scholarism, the other student-run network, appeared later in Admiralty and reiterated the basic principles of the movement. Lau Kong-wah, Under Secretary for Constitutional & Mainland Affairs, so far representing the government in the initial talks, said much the same thing as the students. When the dialogues take place, they will be open to the public. Even so, it is unclear what actual power local Hong Kong politicians and bureaucrats have to craft more democratic electoral processes, which are ultimately in the hands of the Communist Party central government in Beijing. The coming week will be the most sustained test of public feeling for the occupiers so far. The Sept. 28 attack on students by police with tear gas and pepper spray led to a wave of sympathy. Disruption to daily life last week was somewhat offset by the fact that Wednesday and Thursday were public holidays. On Monday, Tuesday and Friday last week, parents had to make arrangements for their children whose schools were closed in the areas of Hong Kong island that have been most affected. High school resumed on Monday, and primary school is set to resume on Tuesday morning in Central, Wan Chai, and Western—all areas in the city’s main urban space. Given that the students are occupying some of the main arterial roads into and out of Hong Kong, including Harcourt Road and Cotton Tree Drive, patience among the public after days of punishing commutes may become stretched. Already in Mong Kok, the more working class shopping district across the water, commuters who had to stand in long lines for minibuses were visibly frustrated with the occupiers. For now, however, the government is indicating that it is unlikely to attempt to use force to remove the students. “The Government is Happy To Talk With the Federation of Students,” said a headline on the Hong Kong government’s official website on Monday. Speculation has been rife about who the individuals are that are violently opposing the pro-democracy protesters in Hong Kong.